In 1988, the SBPC became a 501(c)(3) non-profit organization and expanded its role to support visual arts education in our community. First by awarding scholarships to graduating Lee County high school seniors each year and then by establishing the “Art Angels for Budding Artists (AABA)” program. The AABA provides supplies and/or services to support projects and activities that help provide a quality visual arts experience for students in the Lee County school system. Since its inception in 2010, the AABA has assisted over 6,000 students to express themselves creatively and to learn more about the world around them through art. To foster an interest in the visual arts through our programs, demonstrations, exhibitions and community involvement. To provide opportunities for member artists to improve skills and to display and market their artwork. To help make art a part of the lives of the adults and children in our community. It all started when Elsie Jordan and her husband, Walter, moved to Sanford in the early 1960’s. Lonely in a new town, Elsie, to whom painting was a way of life, began inviting a few friends into her kitchen to paint and critique each other’s artwork. She met every other week with Dorothy Peckham, Margaret Gross and Myrtice Locke. 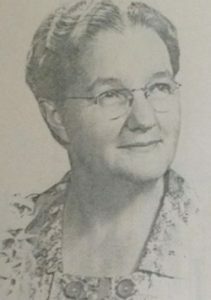 Margaret invited Ruth Ellen Palmer to join and together with Anna Baldwin and Mildred Choplin, the core group was formed. Soon the impromptu club, which met only to paint for the love of it, outgrew the kitchen and had to find new places to meet (much as we still do today). What began as a kind of casual workshop quickly evolved into a more formal organization as membership grew and Elsie began to teach art classes at Central Carolina Technical Institute. Now 19 members strong, the Sanford Brush & Palette Club made plans for its first Art Show. Held in November 1965, the 2-day showing attracted over 200 visitors. Elsie told reporters that the exhibit was educational in nature and that the club hoped to make it an annual event. Elsie passed away in 1976 but in that short time, she created a fellowship of artists and stimulated a tremendous interest in art in the Sanford community that lives on today.